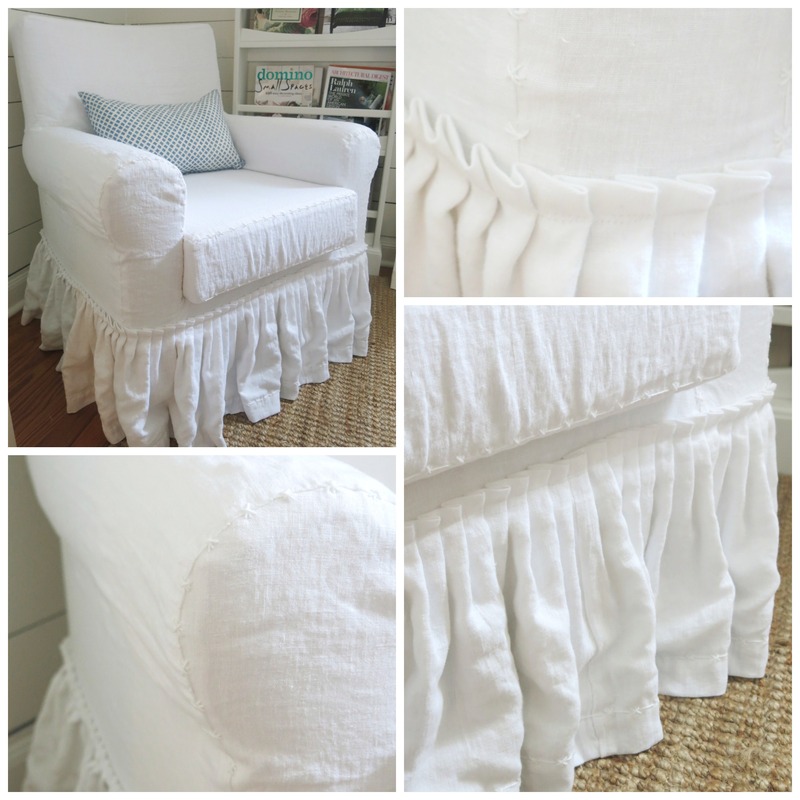 Have y’all heard about the Southern Slipcover madness over at LS Slipcovers? You know how I love LS Slipcovers from my post here! Remember this amazing chair she did for me! Can you even believe the base of that chair is from IKEA..hours of handwork and talent! Well if you thought “I wish they lived in my town” well now you are in luck… LS Slipcovers is visiting the Deep South! 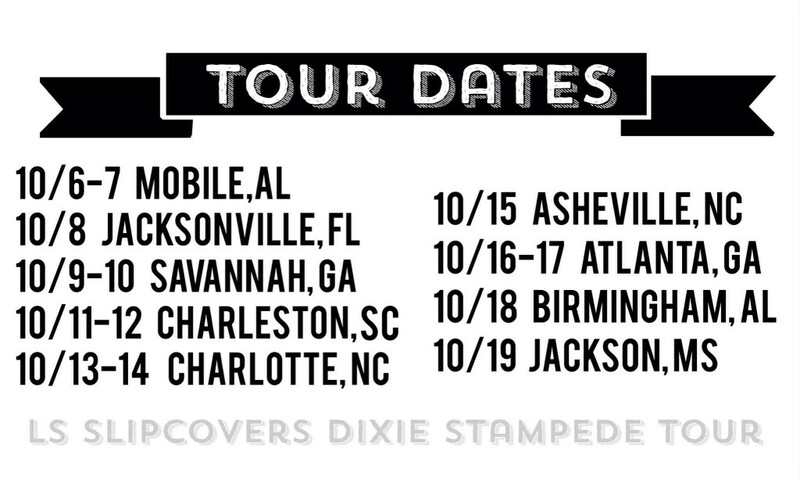 They are calling it the “Dixie Stampede” and its awesome if you live in or near one of the cities listed below. THEY ARE COMING TO YOU! Nathan and Laura and their team have so much energy and they have gotten so many requests for slipcovers in Southern states they are hitting the road to make it happen! 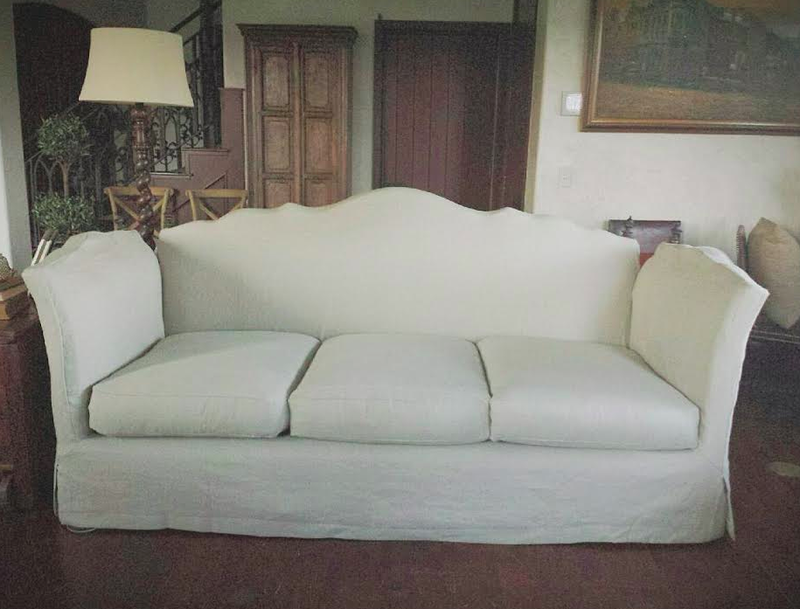 (1) EMAIL Nathan at LS Slipcovers with photos and dimensions of your furniture that you would like slipped. He will ask you what kind of fabric and style you have in mind and give you an ESTIMATE, their contact info is on their website here. (4) Once you know for sure they are coming to your Southern city (and it looks like its happening y’all) they will INVOICE you! (5) Then they will SCHEDULE a day to be at your house….COME TO YOUR HOME! (7) Then y’all hug and say GOOD BYE and they go on their way with your pattern and fabric! (8) And then you will receive in the MAIL your FINISHED SLIPCOVER! 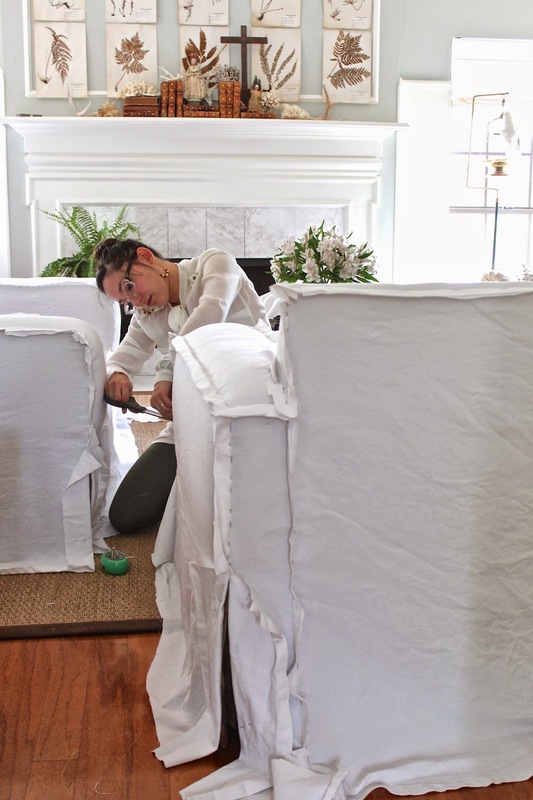 Here is a photo of Laura pin fitting MY custom sofas made by her mother Gracie of Gracie’s Custom Interiors. What a talented family! I can’t wait to see them soon in our new home! And here is a photo of her pin-fitting at my friend Becki’s house! 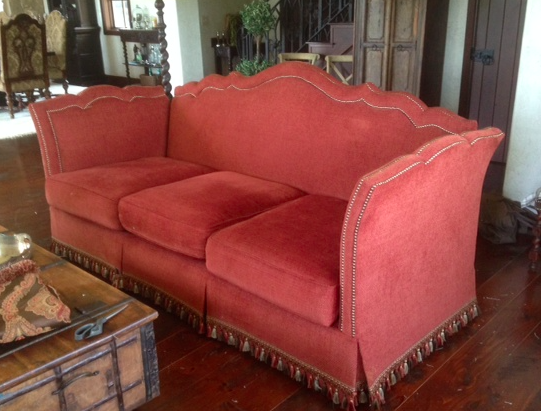 Recently she travelled to Oklahoma to work on my client Stacy’s MAMMOTH red sofa. Staci was so funny asking if it was even possible to make it look good..OH YES! I will never get tired of watching this process! Love it! And most of all I adore Laura as her person and her work…oh her work! What a good combo! 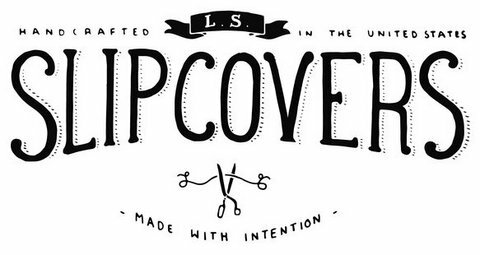 Of course the best way to keep up with LS is to follow them on Instagram @ LS slipcovers and on Facebook here! Good luck Nathan and Laura and all of your family and team, I am so excited and inspired by your willingness to set out on new adventures! Y’all embody the American made spirit! 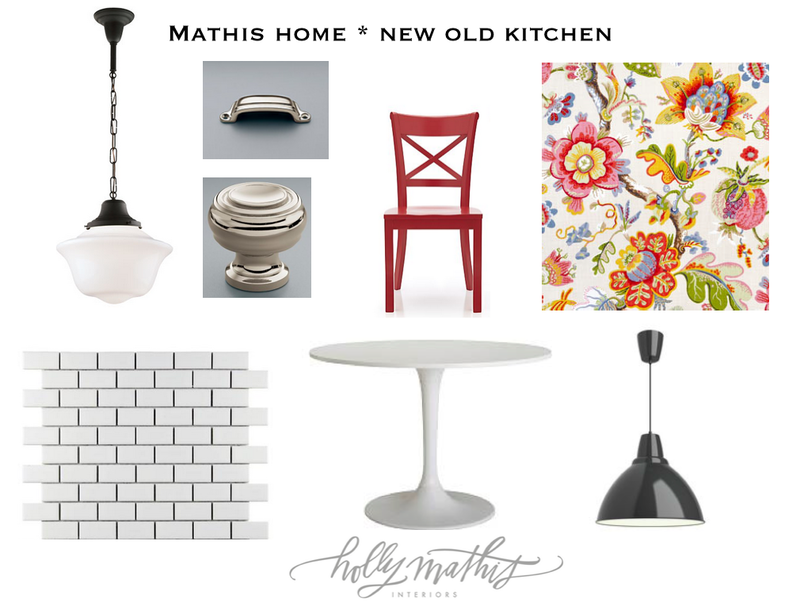 Note: Holly Mathis Interiors occasionally does blogs posts highlighting sponsors who purchase ads. They do pay me fees for their ads and I will always disclose any products or paid advertising at the end of posts. I also work with several online shops and ad networks such as google to help with the expense of maintaining the site. As a rule I do not do embedded links or giveaways. Read more about my blogging policy and philosophy at the bottom of this page. 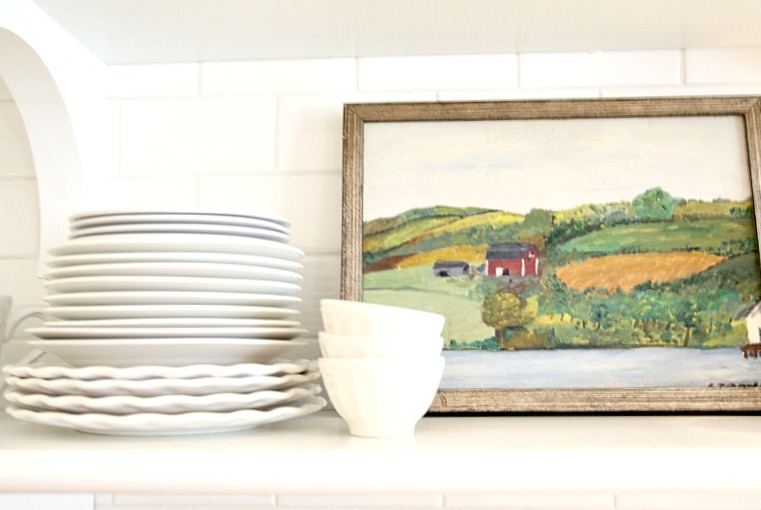 I am going to show you some updates/peeks of the new old kitchen… Started months ago when we first put the house under contact with this idea board. From the beginning I knew this needed to be operation “lipstick on a pig”…in other words cute but on a budget using fabrics and elements I already had, no gut job, nothing major…so here we go! 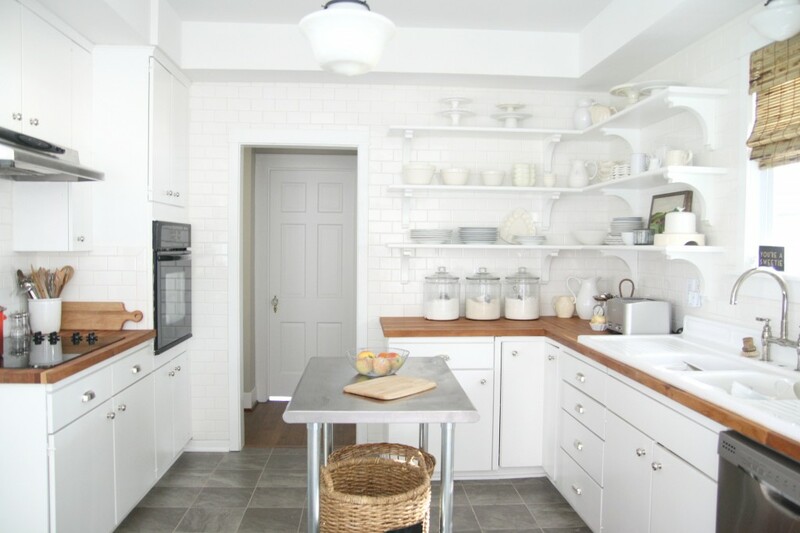 I am thinking there will be a more in-depth kitchen post later with sources and before and afters. It’s not totally complete, nothing hung on walls and no drapes and shelves still not totally styled…but for now here it is! What did we mainly do…lots and lots of white paint….SW Pure White to be exact. 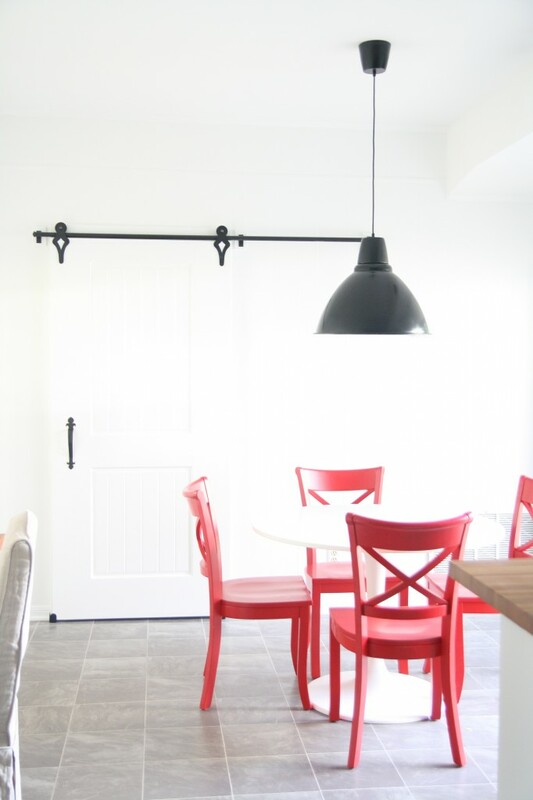 I know its cliche but it really is amazing what a coat of paint can do to a space! I honestly didn’t intend to take uppers on sink side down but it just happened. 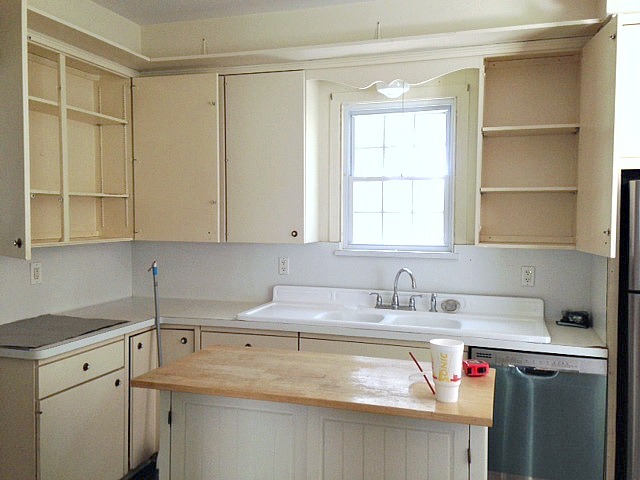 I DID want to do new shaker doors on cabinets but ended up NOT doing that…funny how projects evolve! Yep see what I mean the toaster and coffeemaker are out so this not STYLED (we decorators have to make those disclaimers;;) and I need to scrub paint off of the stool but Daddy got the blind up and the light over sink finally works! 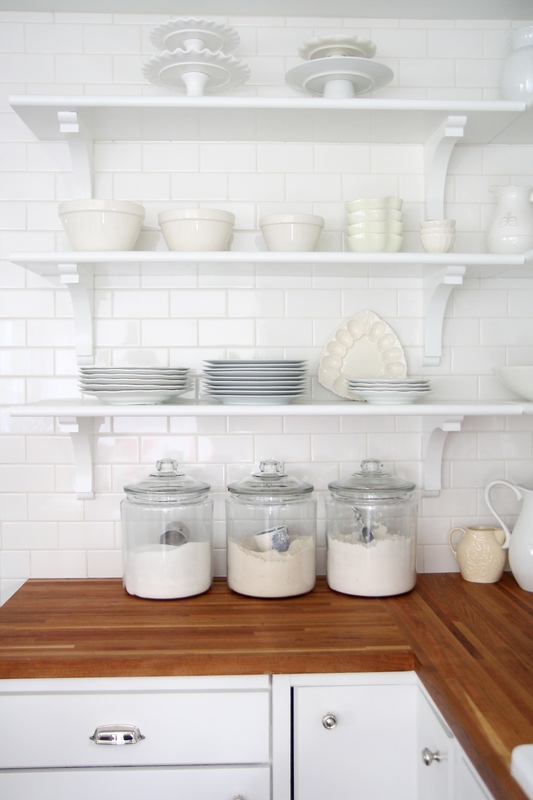 I DO love the subway and shelves..I wish I had gone darker with grout but it’s still all good. 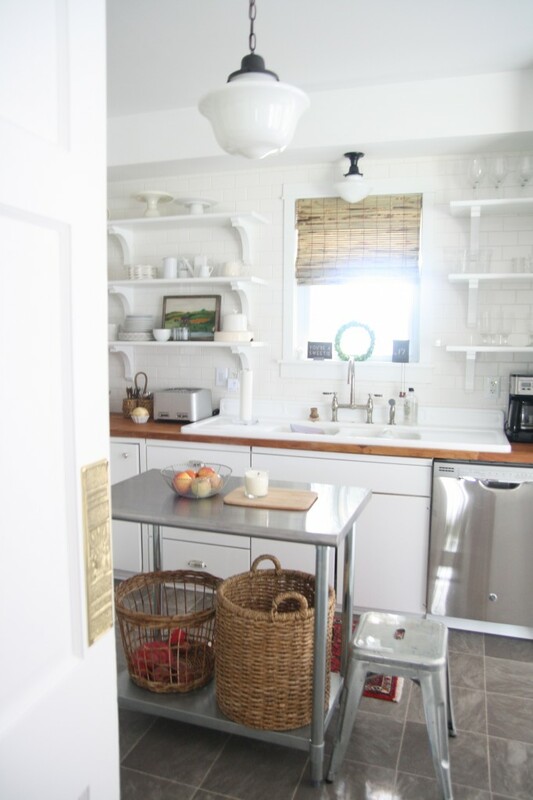 Love that we did tile over the door…need a longer runner. 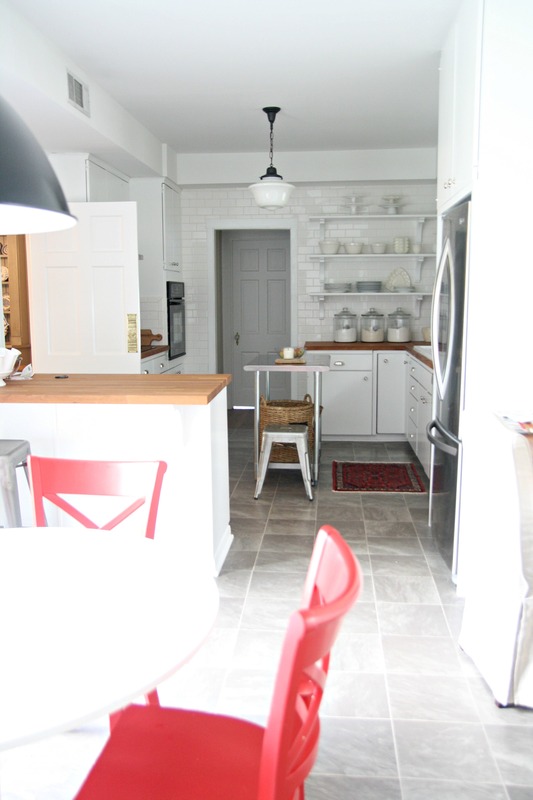 Floor was this gray vinyl when we moved as are cabinets we just painted them…. 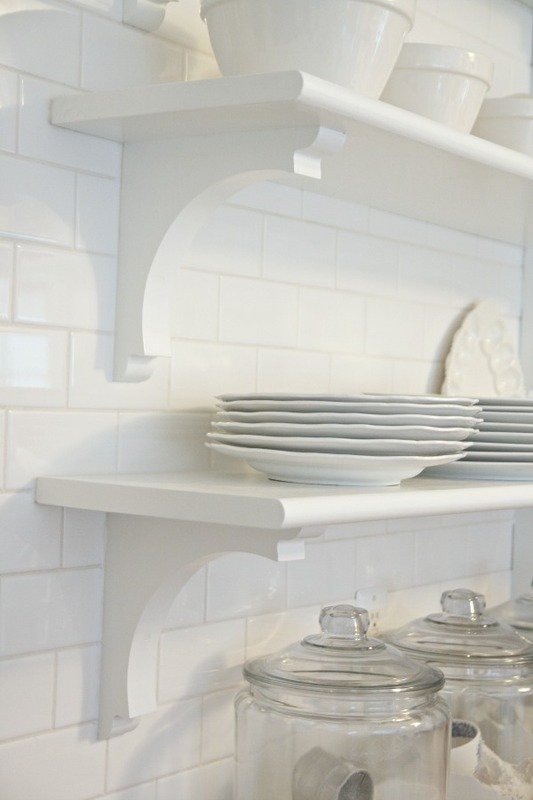 or I should say the world’s most patient and talented carpenter did it all…Kevin Gilmore of Oaks Construction…he pulled out old uppers and did tile and shelves! I knew I could live with the floors and that saved a bundle. BEFORE with the upper cabinets! Of course the sink came back in…so thankful to the previous owners for refurbishing it (new enamel)..the sink is original to the home as far as I know. 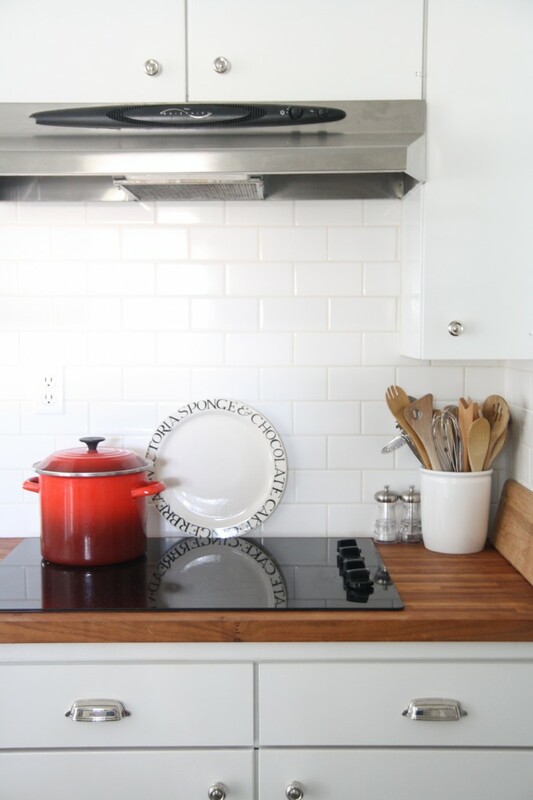 It is shallow but the extra sides make it nice with wood counters. and AFTER with subway and shelving and stainless table from Amazon. Yes I know it looks like my old kitchen and others I have done . . . it’s because I like white and red and subway tile and schoolhouse lights and bamboo blinds. I won’t apologize for that…I do what I love and I am grateful I was able to translate that look here without having to change too much! I just like what I like! 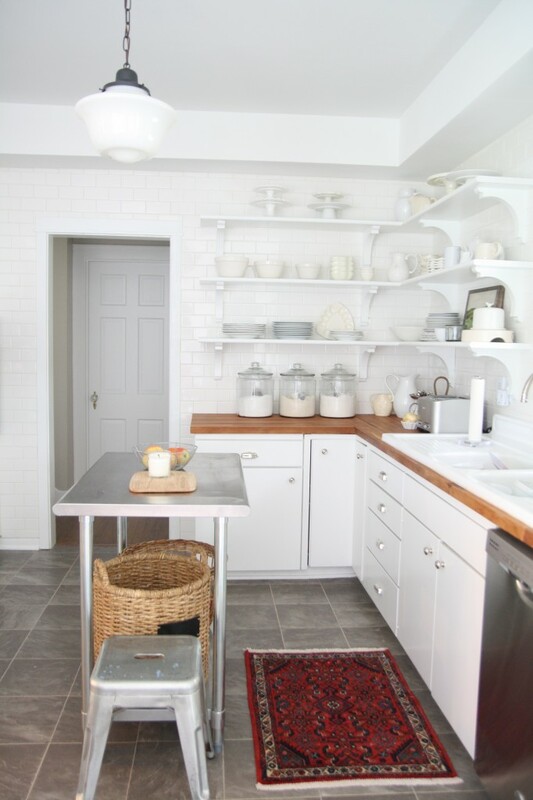 Okay so old houses are quirky and this kitchen’s quirk is that it was originally half the size and then later I think the breakfast eating area and laundry room were added on probably from an old porch….well the floor SLOPES ever so gradually as you walk to that side of the room. Yep you don’t want to drink a glass of wine while touring my kitchen. We left the slope thinking we will tear this all out in a few years and level it out and do new cabinets and wood floors then. It doesn’t bother me but I think it makes the hubs a bit vertigo-ish. So less you think things around here are too perfect,..they aren’t even level! ha ha. But hey we’ve got a cool faucet and subway tile! lol..LAUGH WITH ME PLEASE. I think in old houses you have to just prioritize, what is feasible to do asap before you need to move in, what you can spend on NOW and what has to wait. That is what we tried to do . . .wise choices and some lipstick/paint where needed. SO as we roll our marbles toward the laundry room you see our breakfast area. 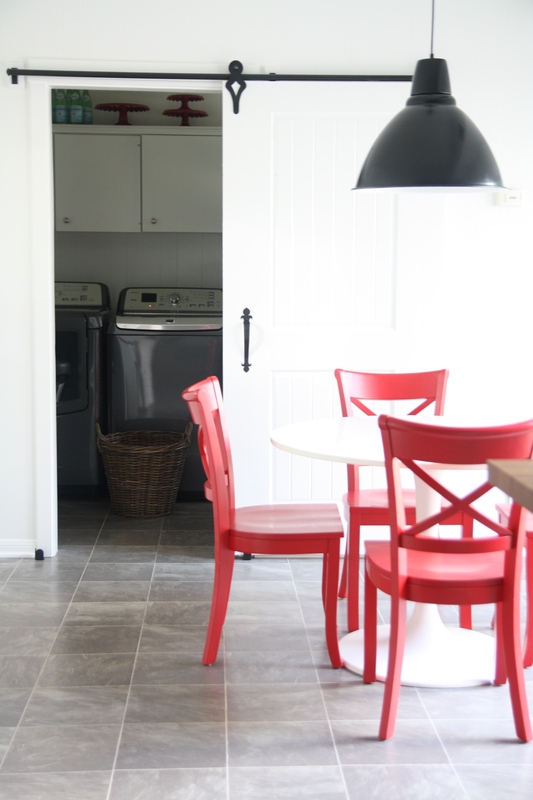 Complete with IKEA dockets table and red Crate and Barrel chairs. I love me some red oh yes I do. My colorful dining drapes are going to go over the sliding glass door next to this area! The gray $29 foto pendant from IKEA got a coat of black spray paint because it was the same color as the floor. The barn door and track are from good ol Home Depot. Kevin had to retrofit it all. I am so thankful I now have a washer and dryer INDOORS. Y’all that cute charming screened porch I used to have. I may miss it but won’t miss the laundry room at the end of it! This is so much better! That and large capacity have changed me! And this is where the magic happens (not!) Seriously I do miss our stove from other house but this is fine; And who are we kidding I am not a fancy cook. The fresh paint and subway makes it all so nice. So grateful. Hardware is from polished nickel Gilmore from RH. 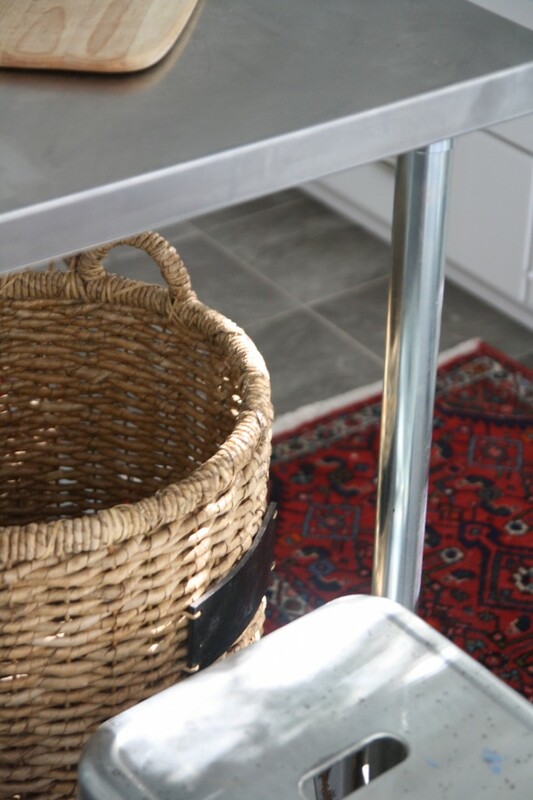 Amazing how a simlpe basket and Amazon work table can make it feel more like home. I love all of the white but the little painting from Etsy and chair and rugs give the color I crave..I tell you I can’t wait to get those drapes up! Brackets from Home depot…the shelves are stair treads. So there ya go..thanks for looking at our new old home..back to packing/unpacking/organizing/purging!